At eC02 Greetings our corporate holiday ecards really do stand out from the rest of the business ecards suppliers out there. With this unique design, the bold yellow gold colour of the bauble looks fantastic against the simplicity of the decorative pine, surrounding this beautiful festive centrepiece. As the card plays, the bauble gleams and glistens, looking incredibly effective. This also creates an excellent canvas for your festive message this holiday season, to your customers. This particular design is new for 2014. 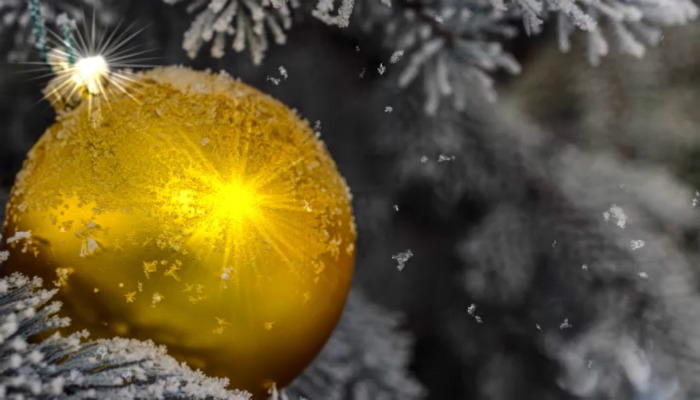 We are highly confident that it will prove hugely popular to our business customers because similar designs such as ‘Bauble in the Snow’ have proven such winners in previous years. The balance of natural outdoor scenery with modern Christmas decorations provides something for everyone. Our cards allow you to add whatever message you wish to the card. However we are more than happy to help with your message if you need us. We pride ourselves on exceptional service and we are more than happy to design the card for you if you wish! Alternatively if you have your own image in mind such as a photograph, we offer a bespoke service where we can build your own tailor made corporate Christmas ecards for you. Simply contact us for more information.